302 pages | 137 B/W Illus. Alternative energy sources are becoming increasingly important in a world striving for energy independence, clean air, and a reprieve from global warming. Solar cells, wind power, and biofuels are some of the competing alternative energy sources hoping to gain a foothold in our future energy mix, and the economic advantages of these technologies are continually increasing as costs are reduced and efficiencies increased. Alternative Energy Technologies: An Introduction with Computer Simulations explores the science and engineering behind a number of emerging alternative energy technologies, including polymer solar cells, algae biofuels, and artificial leaves. It also addresses the environmental need for these technologies. 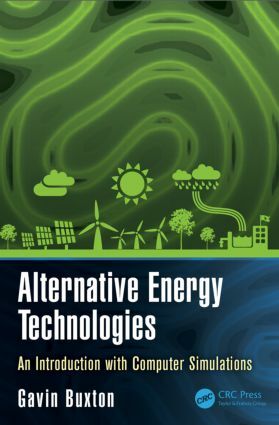 However, unlike its predecessors, this book employs simple computer models implemented within spreadsheet environments to simulate different aspects of the alternative energy technologies and therefore teach the subject matter. Featuring investigative exercises that deepen understanding and inspire further research, Alternative Energy Technologies: An Introduction with Computer Simulations makes an ideal introductory textbook for undergraduate students and a valuable professional reference for experimental researchers. "This book seamlessly meshes modeling concepts with alternative energy concepts and provides the reader with interesting real world simulation examples and exercises. The use of Excel as a modeling platform provides beginners with an easy-to-use framework from which they can visualize each step in the simulation process while checking their results for each step." Gavin A. Buxton is assistant professor of physics in the Science Department at Robert Morris University, Moon Township, Pennsylvania, USA. Previously, he was visiting assistant professor at Case Western Reserve University, Cleveland, Ohio, USA; postdoctoral research associate at Durham University, UK; and postdoctoral research associate at University of Pittsburgh, Pennsylvania, USA. He holds an M.Sci in engineering physics (hons) and a Ph.D in computational physics from Sheffield Hallam University, UK. His work has been published in numerous prestigious journals and books including Soft Matter, Encyclopedia of Energy Engineering and Technology, Langmuir, and The Journal of Chemical Physics, among others.